The understanding of the Miocene play fairways in the Eastern Mediterranean can now be significantly enhanced by combining integrated reservoir distribution and hydrocarbon charge models based on regional 2D seismic with 3D seismic data available offshore Lebanon. The seismic section below (TWT, Sec) is a 210 km PSDM 2D line running from south to north through the Levant Basin (for location see map on page 39). The Southern Levant Basin has seen over 30 Tcf of gas discoveries in the Early Miocene sequence (yellow to orange) since 2009. The seismic line to the right is an example of the 3D fast-track volume from offshore Southern Lebanon, acquired by Spectrum in 2012. These 3D data give clarity on reservoir architecture and provide the definitive data for mapping structures, defining the timing of structure formation and identifying additional play systems. The end of 2012 brought with it the exciting announcement from the Lebanese Petroleum Authority that their first Offshore Licensing Round will open in May 2013. Now that the clock is really ticking, counting down towards the bid submission period, it is time to assemble a ‘bidding dataset’ to support the evaluation of blocks in the round. 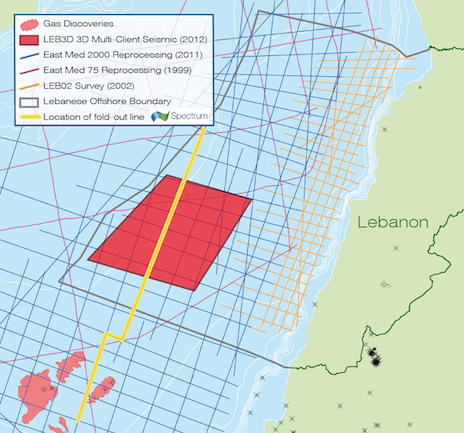 For some companies this will first take the form of acquiring a 2D seismic grid across the entire Lebanese offshore – particularly useful if the dataset is extended over the major gas discoveries to the south. 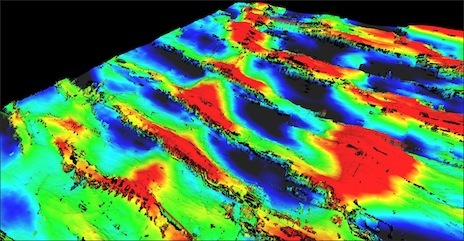 And for companies further advanced in evaluation, it is time to upgrade from regional 2D seismic data to evaluating the available multi-client 3D datasets. 3D time structure at top Early Miocene illustrating the approximately 800 km2 super-closure in the south-west of offshore Lebanon. Source: Spectrum Map showing the location of the foldout line on the previous page, together with available 2D and 3D data . Source: Spectrum In the Eastern Mediterranean, an Early Miocene structural lineament separates the Southern and Northern Levant Basins. This lineament, referred to as the ‘Levant Ramp’ (Taylor, 2011), runs close to the southern Lebanese border, and separates two discreet sub-basins. To the south is the biogenic gas-prone, thin-reservoired, complex-structured and rather well-explored Southern Levant Basin. To the north is the thermogenic oil- and gas-prone Northern Levant Basin offshore Lebanon, with thick reservoirs and numerous large structures which are unexplored. It is curious that for each play element (reservoir, charge and trap) the Northern Levant Basin is lower risk or more oil-prone than the Southern Levant Basin. Our play fairway understanding was developed using well data and a 2D seismic grid that extends across the whole Levant Basin (Hodgson, 2012). However, the acquisition of the new 3D seismic volume allows the fine detail of this play fairway in the Northern Levant Basin to be examined for the first time. Fortunately, offshore Lebanese waters are blessed with numerous 3D datasets, giving about 65% coverage of the offshore area, most of good quality. Inevitably the underlying geology makes some of these datasets more prospective than others. The turbidite sandstone reservoirs of the Early Miocene can be traced south and west back to their provenance in the Nile Delta. This Early Miocene seismic sequence is relatively thin in the Southern Levant Basin discoveries (thickness ca. 100– 300m), yet can be observed on the seismic data to dramatically thicken across the Levant Ramp to the north (thickness ca. 500–1000m). Here, the high clastic content is evident from the seismic response. Whilst lateral reservoir quality variations might be significant in the Syrian Arc synform-constrained channelways to the south, this is not expected within the large turbidite fans prograding into the Northern Levant Basin. Structures Clearly Imaged Structurally, the Southern and Northern Levant Basins appear very different. The plays to the south of the Levant Ramp are shallower and comprise both inverted Syrian Arc half grabens and highly tectonised basement block drape structures. In the Late Miocene, when these complex compressional structures were forming in the south, across the Levant Ramp to the north the structuration was dom-inantly extensional, generating the simple piano-key fault blocks characteristic of the Northern Levant Basin. These faults are superbly imaged with 3D seismic data and the fault-aliased mapping problems of 2D data are readily resolved, revealing simple three-way dip and one-way fault closed structures, with throws in excess of 400m. Unsuspected from 2D data, the western half of the 3D dataset reveals an anticline running north-south formed by early Upper Miocene compression, cut by east-west faults and generating a number of interconnected structures with well-defined closures. Each structure is 20–60 km2 with up to 400m of relief, whilst the north-south anticline has a time super-closure of over 800 km2, which will increase in areal extent in the depth domain. To the south the structures are lower relief (up to 200m), including the large Hyperion structure visible on the 2D data (Hodgson, 2012) and now much more accurately mappable on the 3D data. To the east, more features can be found on the 3D data, including the large and surprisingly high relief (>1000m) Oceanus structure. This dramatic structure unusually deforms the base salt and shows deformation structures within the salt. It manifests itself as a gas chimney in the post-salt section and an anomaly associated pockmark on the sea floor. An unexpected benefit from the 3D seismic data is the identification of base salt structural closures, and a considerable thickness of turbidite sands just below the Messinian salt, creating a second play fairway to target in the area. 3D base-salt time structure reveals numerous new closures in addition to a thick clastic unit just below the salt. Source: Spectrum The hydrocarbon charge systems for the Northern and Southern Levant Basins are very different. The existence of a mature oil source is demonstrated by the observation of multiple oil seeps on SAR and Landsat data above the pinch out of the eastern Mediterranean salt canopy along the Levant Basin margin. 3D basin modelling demonstrates that to the south of the Levant Ramp, the Oligocene is unlikely to be thermogenically oil-prone and indeed the majority of the hydrocarbons discovered are biogenic in origin. To the north of the Levant Ramp, in addition to a biogenic gas play, the Oligocene has been oil-generative since Messinian times, i.e. after the formation of the simple fault block structures in the Upper Miocene. Deeper sources in the Early Tertiary and Cretaceous will have been mature for oil and gas condensate over a longer period (Ali, 2012; Dupin, 2012; Dubille 2012). Interpretation of the 3D data acquired by Spectrum in 2012 demonstrates that this area not only has the highest chance of success for generation and trapping of thermogenic hydrocarbons offshore Lebanon, especially in the large basin centre anticline, but it also has large, simple structures and the most compelling reservoir case. Indeed the 3D data shows that structures in south-west Lebanon are less complex than those encountered in the recent gas discoveries to the south, and suggests strongly that the rapid commencement of drilling on the low risk Lebanese structures is soon to usher an age of hydrocarbon independence for the Lebanese nation. Hodgson, N. (2012): The Miocene hydrocarbon play in Southern Lebanon. First Break, vol 30 issue 12 – December 2012. P93-98. Ali, H. (2012a): Offshore Lebanon Basin Modelling Report. Stratochem Services. With significant advancements in seismic acquisition technology, it is time to re-visit the East Shetland Platform.